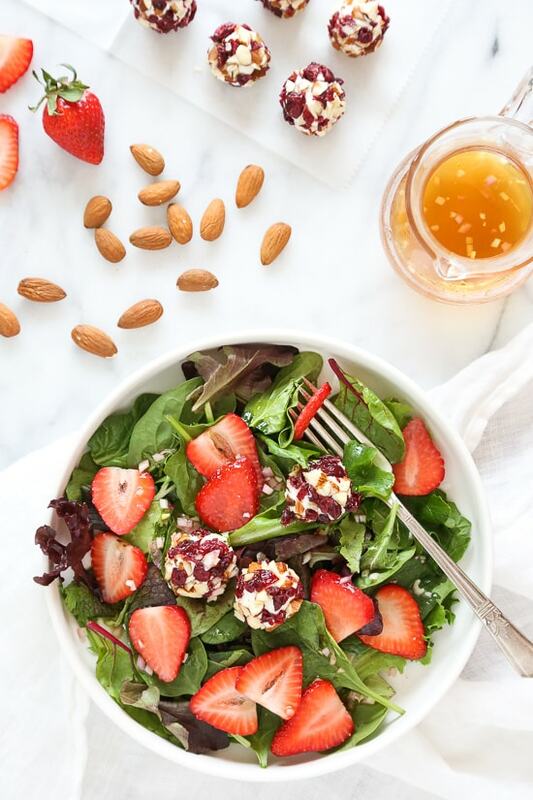 This beautiful Spring Berry Salad with Almond-Cranberry Crusted Goat Cheese is studded with strawberries and served over baby greens, but you can use any seasonal berries or a combination of berries instead. Serve this salad alone or alongside grilled chicken or fish. 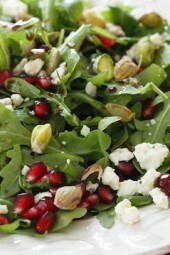 This salad is great for a dinner party, or for Mother’s Day – it’s not just delicious it’s also pretty to look at. I would make extra dressing if I was making this for guests. You can make the cheese ahead and assemble when ready to serve. Roll the cheese into 12 small balls with your hands, 1/3 oz each. In a small bowl combine the nuts and craisins. Roll the cheese in the nut mix and refrigerate until ready to eat. Place all the dressing ingredients in a small bowl and whisk. Combine the salad ingredients in a big salad bowl and toss with dressing or you can divide the ingredients equally between four plates. Hi Gina. Any thoughts on using dates instead of craisins? I have a ton of dates in my fridge that I would love to use. 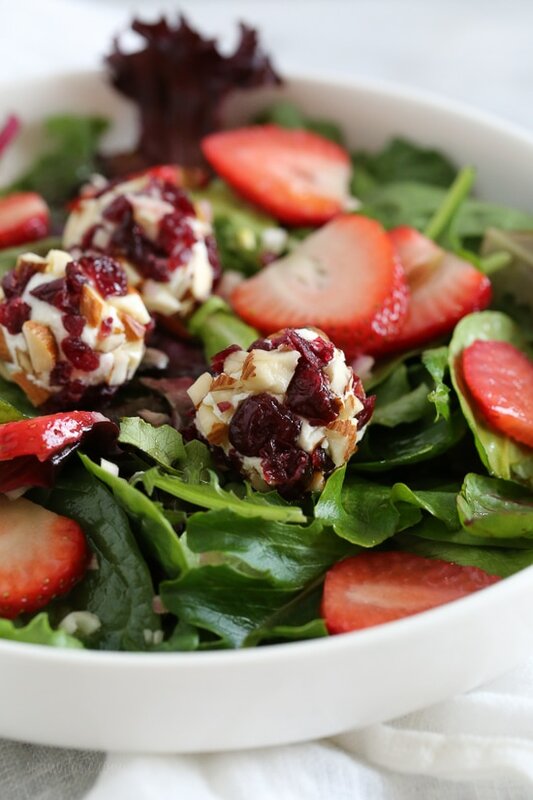 Everything in this salad sounds great except for the goat cheese, it’s not a family favorite. Any alternative suggestions of another soft, pliable cheese? This is my new favorite salad recipe!! 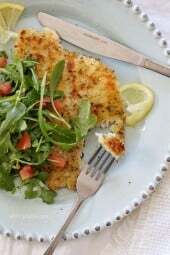 Made this tonight with tilapia piccata (following your flounder piccata recipe) and the pairing was delicious. Now I’ve finally found a salad I can be excited about! The dressing was wonderful too – nice and light, but flavorful. Didn’t have shallots around, so I used onion instead, but still came out great. We are having this for dinner tonight. I’m going to add a little cut up prosciutto and I didn’t have almonds but I had walnuts! Won’t except my e mail address ???? Love this salad and absolutely love this dressing.! Can you tell me how many points per tablespoon the red wine vinegarette is? You are officially my go to choice for all recipes! Thank you thank you thank you!! This is fantastic, I’ve made it several times now. Does the 239 calories include the dressing too? If so, how much? I made this today for the beach and added chicken. So yummy! Thank you so much for this recipe. I love it! I made this salad as part of Mother’s Day lunch and it was a huge hit! 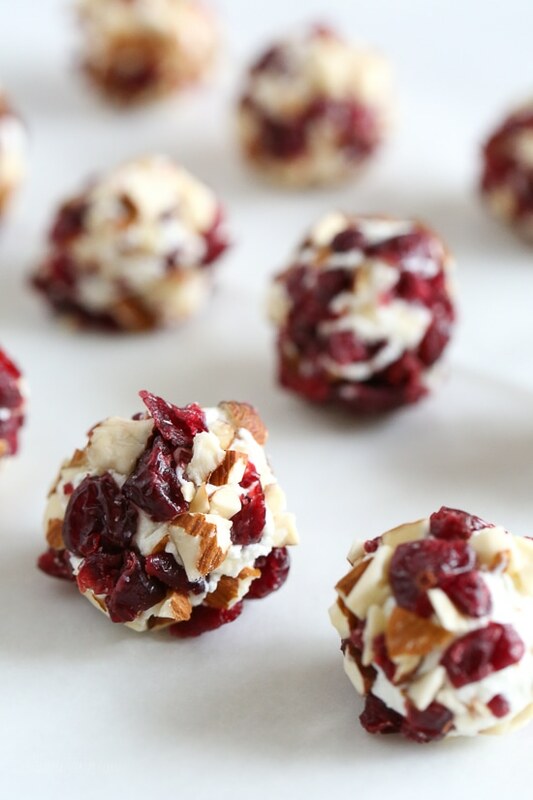 I couldn’t find craisins so I used dried tart cherries and they were great. I also add some blueberries to the salad. Thanks for this recipe. It was really delicious! I really liked this salad. I sliced up a hard boiled egg and put it on top for a bit more protein, made a great lunch. Gina, any suggestion on substituting the goat cheese? Gina, this is a hit. It is similar to another salad that I make in the summer, but the goat cheese balls are a stroke of absolute genius! I made this yesterday for myself and my husband for lunch. I paired it with your crustless spinach pie, and this was our picnic at a local winery yesterday. 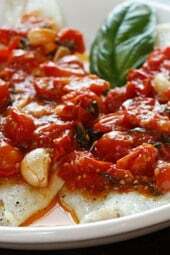 My husband raved about how it tasted so gourmet, but was still healthy. I confess that I added some diced mango and a few kiwi slices to the salad as well. It amps up the color, and portion without adding any points. Another winner! Great idea, love the colors! I just made this salad! so yummy. The goat cheese is soft and smooth. The dressing is sweet. vert good! It won’t accept my email?! Are you trying to subscribe? Email me please! Oh, my! I’m afraid I’d eat all those yummy goat cheese balls before I finished assembling the salad! This looks amazing. I was thinking the same thing, then thought, why not? Made a double batch and bagged up half in little snack bags, 4 balls each. Yum!! It says divide between 4 plates so…four servings. Can also tell because 12 balls total divided by 3 balls per servings equals four servings. How many servings does this yield? It doesn’t say. I’m guessing 2? The directions say that you can divide equally among 4 plates. Can you use something else rather than goat cheese? Maybe cream cheese mixed with a little plain yogurt? 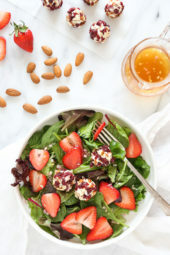 I think it would also be good with something like brie or feta, but if you do that I would just toss the cranberries and almonds over the top of the salad. Great idea. Any specific tips on how to make grilled chicken the best and most flavorful? Thanks.